Even as Nigerians are still in full anticipation to receive President Umaru Yar'Adua in sound health to continue in his good works for the nation, Vice President, Dr. Goodluck Ebele Jonathan has said the year 2010 is significant for Nigeria because it heralds the nation's golden jubilee as a sovereign and independent nation. In a New Year message delivered on behalf of President Umar Musa Yar'Adua, the Vice President acknowledged that poverty remains a major problem in many parts of the country adding that true progress and development of the country can only begin when all citizens, without exception, move out of a marginal existence. He insists that this administration shall ensure fiscal discipline, greater commitment to budgetary implementation, avoid waste and fight corruption. "All of these will require more fiscal discipline, and greater commitment to budgetary implementation. We must also do more to ensure project completion and more visible action in cutting down on waste, especially in the public sector," Vice President Jonathan said on his maiden broadcast on behalf of President Yar'Adua. Nigeria's number two citizen notes issues of violence that occurred during the year such as those caused by religious intolerance adding that government will through the adoption of a mix of proactive measures strive to avert this in the future. Vice President Jonathan also recalls the recent attempted bombing of a United States-bound Airbus A330 Northwest Airlines Flight 253, carrying 278 people and 11 crew members Mr. Umar Farouk Abdul Mutallab and assures that security agents will be more vigilant in the future. "Religious intolerance and violence resulting to the unfortunate loss of lives and property also occurred, causing anxiety and apprehension among peace-loving Nigerians. "As if these were not enough, on Christmas day, we were presented with the most disturbing report that one of our own attempted to commit a most heinous terrorist act. "Gladly, tragedy was averted, but this singular act, which is completely alien to our culture and way of life, has no doubt inflicted deep wounds in our national psyche. "Following this unfortunate incident, even if isolated, our security services will be more vigilant and also work concertedly to guarantee the security of life and property throughout the country, especially at our ports of entry and exit. "Let me restate, as Mr. President has always insisted, Nigerians must be able to live in complete safety and security at all times. "Towards this end, we will adopt a mix of proactive actions, including enhanced intelligence-gathering, effective pre-emptive crime detection and containment as well as result-oriented investigation and law enforcement. "Government will also encourage greater inter-service and inter-agency co-operation and technological optimisation to match new challenges. "Our overall response will be firm, effective and robust," The Vice-President said. The Vice President regrets the failure of government to attain 6000 megawatts of power before the end of 2009, and promises that efforts will be made in the New Year to address the challenge of power supply and ensure higher generation as well as more effective transmission and distribution. Vice President Jonathan said: "At the inception of this administration, we promised to drastically improve access to electric power by the end of 2009. "This is because power is a basic necessity in a technologically-driven world. Our target, which was modest, was set at generating 6,000MW of electricity by year end. "While I am happy today to report that we have achieved some substantial measure of success, I regret to mention that for a number of unforeseen and unavoidable reasons, this target could not be met. "Millions of Nigerian are therefore still without power. For this, I render, on behalf of government, very sincere regrets. "As we enter this New Year, spirited efforts and resources will be mobilised to address the challenge of power supply and ensure higher generation as well as more effective transmission and distribution." Vice President Jonathan said that President Yar'Adua might soon return to the country to continue his "good works with renewed vigour and vitality." "Let me assure all Nigerians that under Mr. President's visionary leadership and policy direction, the ship of state continues to sail. "Although Mr. President has been away from us for sometime on account of a medical condition, he has maintained sustained interest and optimism regarding the various challenges, as well as the possibilities available to us as a nation. "By God's grace, the President will return soon. We are immensely grateful to all Nigerians, both at home and in the Diaspora, for their concern, prayers and best wishes. I am particularly encouraged by this show of goodwill towards Mr. President and the first family," the Vice-President Jonathan said in the statement made available to journalists in Abuja, the nation's capital city. He expressed concern at the worsening fuel crisis in the country but assured that the government would soon end the problem. 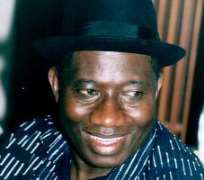 Jonathan said, "I note with concern that Nigerians continue to suffer pain and stress at fuel queues. Be assured that this situation is quite disturbing to government. "Far reaching measures are therefore being taken to make this unfortunate trend a thing of the past." The vice-president said the immediate challenges the government intended to address in the New Year were those in the banking sector, particularly the loss of jobs by workers. He added that government would also stem rising youth unemployment, improve infrastructure in the country, develop the Niger Delta, and protect lives and properties in 2010. He also said the government would continue with the ongoing efforts to reform the electoral system. He said, "This year represents a watershed in our efforts to conduct peaceful and credible elections and the consolidation of our democracy. "Let me reiterate Mr. President's commitment that elections must not only be free and fair, but must be all-inclusive and conducted with the utmost transparency. "Our elections must enjoy the indelible mark of credibility and acceptability both nationally and internationally. "Towards this end, we remain focused in the actualisation of the promise of working closely with the National Assembly to implement far-reaching electoral reforms to ensure that future electoral politics in Nigeria will witness a new lease of life." He said that in spite of the challenges that the country faced in 2009, Nigerian must use 2010, which is the nation's 50th Anniversary, as a fulcrum for national renewal and repositioning. "Today, we enter year 2010 as a nation, as families and as individuals with a new hope and a new promise. "As a united and strong Nigerian family, we must embrace the new season determined to make the most out of the opportunities that this year will offer, by translating into reality, our collective hopes and aspirations for a peaceful and prosperous Nigeria. "The year 2010 is particularly significant for us as it heralds our golden jubilee as a sovereign and independent nation. "In the course of 2009, government recorded far-reaching achievements in various areas of our national life through the implementation of the Seven-point Agenda. "As this is not an occasion for stock-taking, various ministers have been directed to render details of their achievements in the days ahead. "However, the year that has just passed also threw up numerous challenges for our nation. For instance, in many parts of the country, poverty remains a number one problem that must be confronted. "True progress and development of the country can only begin when all our citizens, without exception, move out of a marginal existence. "Beyond policy pronouncement, priority attention would therefore be placed on training and retraining in the areas of entrepreneurial development, skill acquisition and provision of more financial incentives and packages to position our youth to better manage their own businesses," Vice President Jonathan said.